Had a really fun short trip this morning to Calvert Cliffs. The tide was especially high and I didn't expect many people to be there due to this fact and upon arrival noticed only a few cars. Then I noticed a group of teenagers surrounding the gate with green shirts that said, "Beach Patrol." It was a weird scene. There where a bunch of tennage girls all on their phones and the teenage boy says, "It's $18 to pass." I only had $9. Luckily he let me in but it seems like a ridiculous price to pay to get beach access. 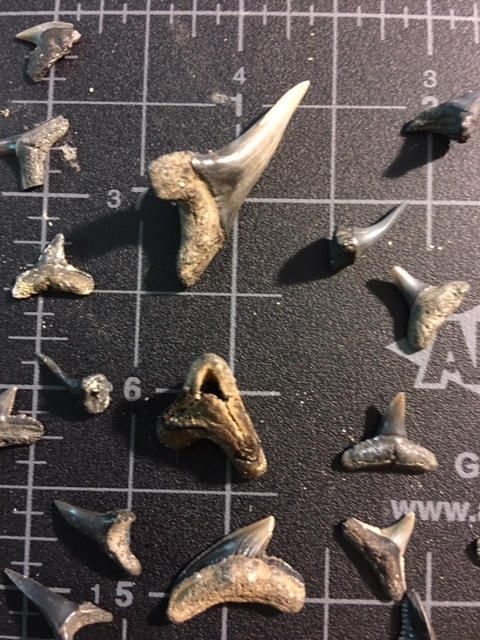 Had a good trip and found more cow shark teeth than all my other trips combined. Not sure why. Cow shark teeth aren't as rare as a Meg or Chub but they aren't that easy to find. See below. Horseshoe crabs moving in the surf. Almost stepped on them. Very high tide at 7:00 am. I was out there with four others. Excellent camouflage for a moth on the Choptank Formation. Starting things off right by finding this Mako within the first five minutes of searching. I can usually get down to that pier out there but the tides where exceptionally high today. High tides and some freshly fallen trees. Watched a guy step on this Hemi. Held my breath he wouldn't notice it then walked over and snatched it up! Large turritella from the St. Mary's Formation. This stuff had Ecphora and other shells but they were to chalky and fragile to recover. You know it's been a good day when you see this on your way back to the car. 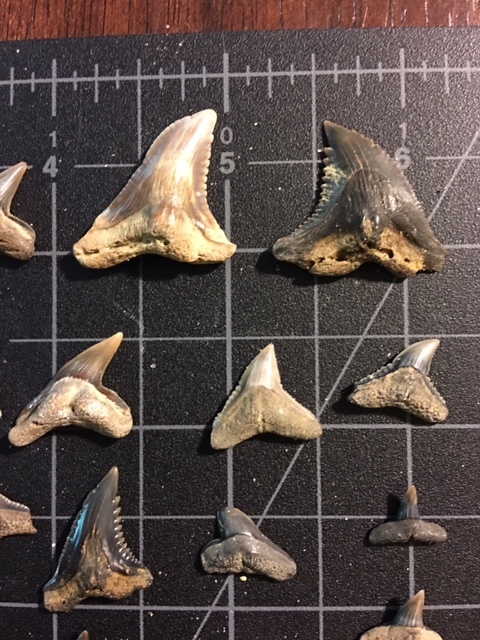 8 Cow Shark teeth of various sizes. Another nice Hemi up top. Great haul! Glad you got out and thanks for the post. 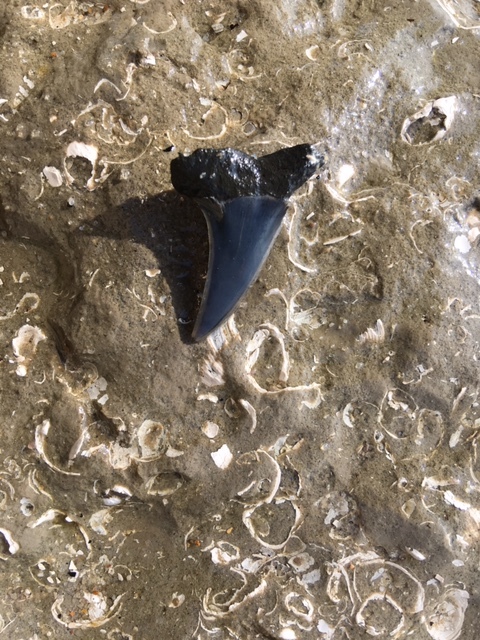 I always like seeing posts from bayfront park as that is the first place I ever hunted shark teeth, about 30 years ago. Great finds! You did real well with the Cow sharks! Congratulations! 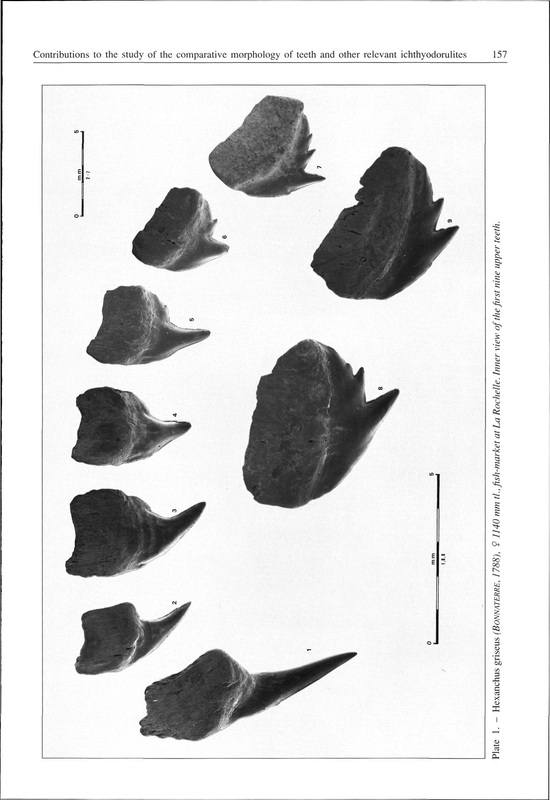 One of your cow shark teeth is actually a bramble shark tooth (Echinorhinus). Which one? I'll put that in Collections as I don't recall seeing any there and Wikipedia says they are rare. I wonder if these are currently found in the Chesapeake Bay or if this is ancient. Looks old due to the root wear. I bet there was some really good stuff back then. I found half a Meg and some very large Hemi's but am really aiming for a complete Meg or Chub. The tooth above the awesome cow shark tooth is a bramble shark tooth. Thanks @gavialboy for noting that. From what I have heard these are very rare. Very nice finds! I'm completely amazed at the amount of cow shark teeth that you found! I love finding them! I love your cow shark teeth and your hemis ! It wasn't amazing. I did find one 3" chub before I moved away, though. It's the one in my avatar. Found it just past that bend south of the main beach. That is awesome. I found a nice Meg a few months ago but it was only half. Still happy. That place is the best. 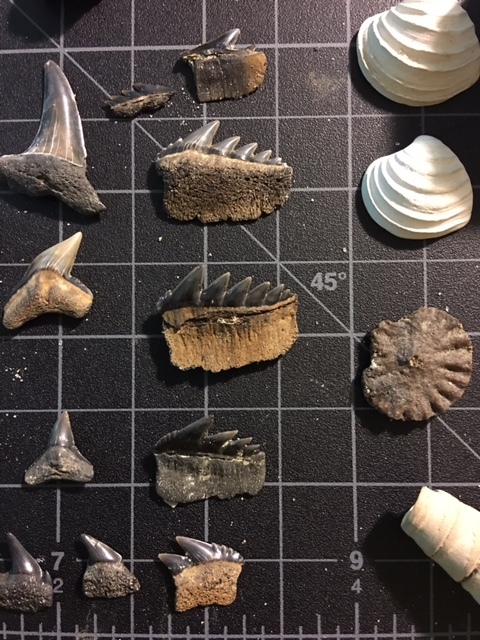 I lived in VA for 40 some years but never hunted fossils, now I need to come back and find a Cow Shark, or maybe a bramble will do. Great job! @Calvin Jenkins there's some good stuff to be had. Brambels are tough to find though. Where you live I bet there are some nice Megs and Chubs. Good luck hunting! Looks like you did well considering the high tides. You really cleaned up on the cow sharks. Nice job! First time hearing about a bramble shark so I am going to have to look through some of my collection and see if I have any. That $18 is a tough pill to swallow. Glad they let you in with just $9. Nice haul! Nice haul of cow shark teeth. I think the "bramble" is an upper cow shark tooth. @ynot definitely a Bramble. 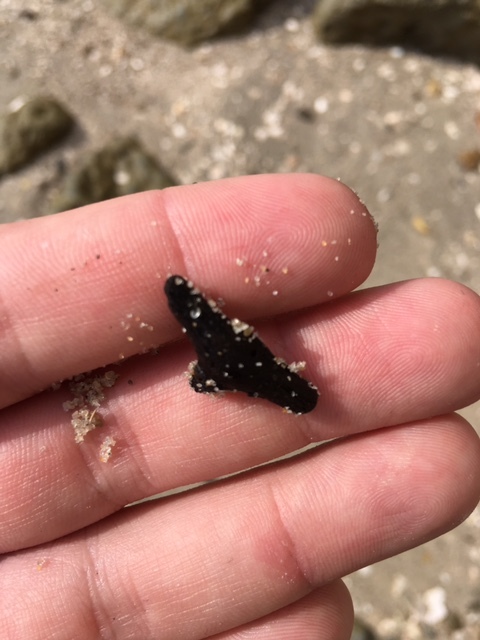 I've never seen a cow that spaced out and I've found numerous cow shark teeth. "I've never seen a cow that spaced out "
Please what is the latin name of cow shark ? It is an hexanchidae but which one ? Nice cows!!! I'll have to head that way soon. @Coco hexanchus sp. and notorynchus sp. For me this fossil tooth looks like a recent upper Notorynchus cepedianus, the second one after the parasymphyseal tooth (the tooth on the pic is put back to front). I posted the links to a whole bunch of these papers a while back,BTW.